How to survive winter? Well, if you live where winter brings darkness and cold harsh weather, you probably just want to crawl into bed and pull the covers over your head for the next four months. Am I right? What if I were to tell you it doesn’t have to be that way. 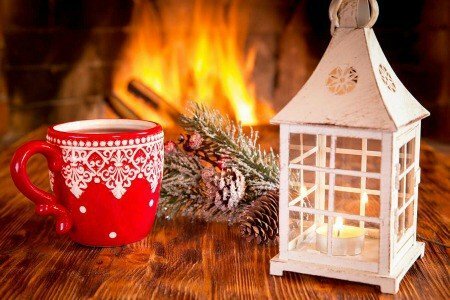 That in some countries, winter is embraced and celebrated, with candles, coziness, firelight, and friendship. Where people just come together and share a meal, or settle indoors with a big chunky blanket, a cup of tea and a really good book. Sounds great right? Well it’s real. There really is a way for all of us to survive winter with joy, mindfulness and creativity. The concept is Hygge, a way to bring coziness and happiness into your life every day. 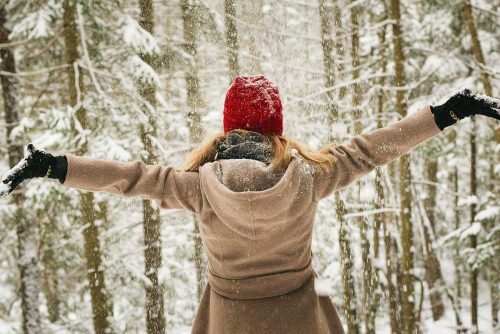 I’ve got a list of 21 ways to feel happy in winter – from big cozy sweater, and hot buttered drinks by the fire, to a family game day. What about Random Acts of Kindness? Or visiting shut-ins during the holidays. We’ll show you many creative ways, for little or no cost, to find joy and embrace the challenges that winter brings. Sound like fun? I thought you would like this. We’ve also curated a lovely little shop of Hygge gifts and you can check it out below! 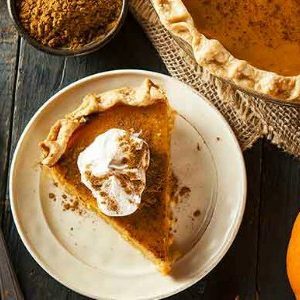 Once we get past Thanksgiving (October in Canada and late November in the United States) well, the days are definitely shorter. I get up in the dark and come home in the dark. Ugh. 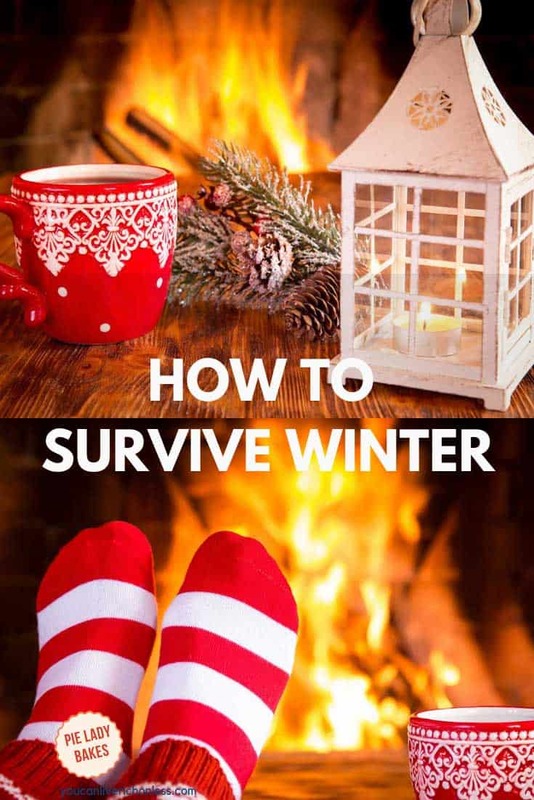 At this time of year people fall into two categories: The “I hate winter” group or the “How to survive winter” category! Even our dogs get confused. Now I’m not sure a mini schnauzer and a wheaten terrier understand the benefits of Hygge and Coziness, but I’m pretty sure they’ve picked up on the fact that I’m really ok with winter these days, and actually enjoy the cold, the exercise, and the coziness with my chunky knit blanket, beautiful fat white candles, a great book, and quiet time for snoozing. If you are enjoying this post, we’ve written extensively about Hygge. 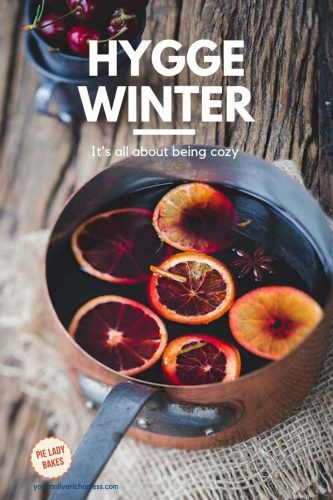 While typically enjoyed during the winter, the Danish, you can live Hygge all year long. You can Live Hygge in Spring and summer hygge has so many possibilities! Hygge falls into so many categories too, like self-care, personal development, mindfulness, simplicity, home decor, and my favourite – happiness. Yep, plain old happiness. What could be better? Hygge living does not require you to buy anything, change your lifestyle or diet. Hygge life is all feelings. Like those feelings you get when visiting a dear friend you haven’t seen in a long time. That feeling you get when remembering a happy childhood memory. 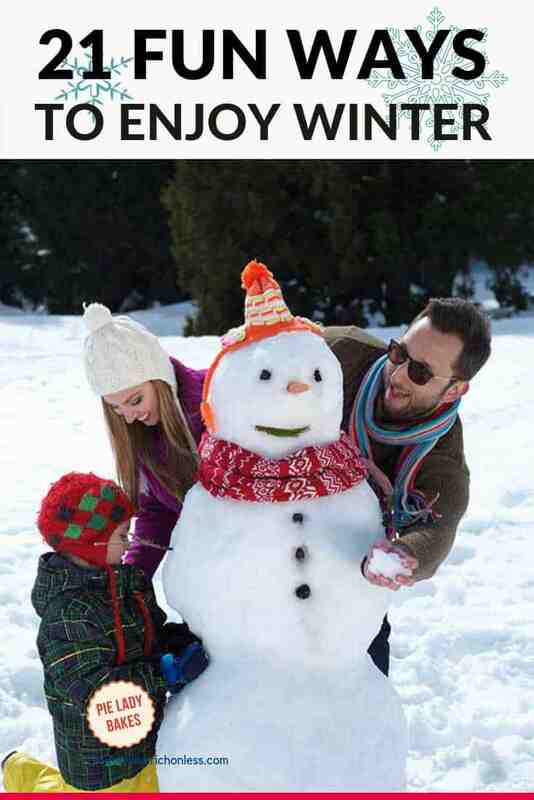 It’s listening to your child share their excitement about snow, tobogganing or Christmas. 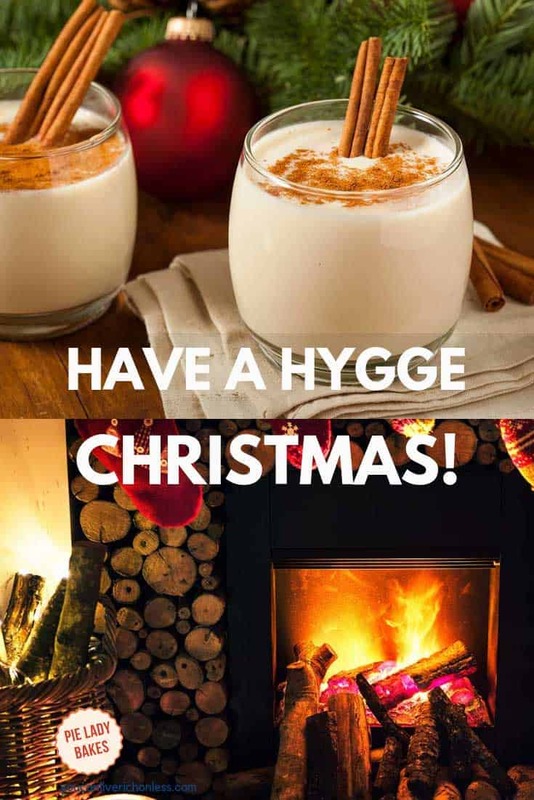 Hygge is often stated as the “Danish art of happiness” and The Little Book of Hygge describes the concept in detail. The Danes believe that Hygge is about togetherness, comfort and the experience itself, of being together or enjoying comfort and coziness on your own. How can I survive winter? Surviving winter is no joke. And we’re not talking about winter camping here – but then again that might be kind of fun! And there are fun ways to winter camp! I would suggest that getting through winter, surviving the short days, cold weather, and general annoyances that go with the season, is about adjusting your mindset. 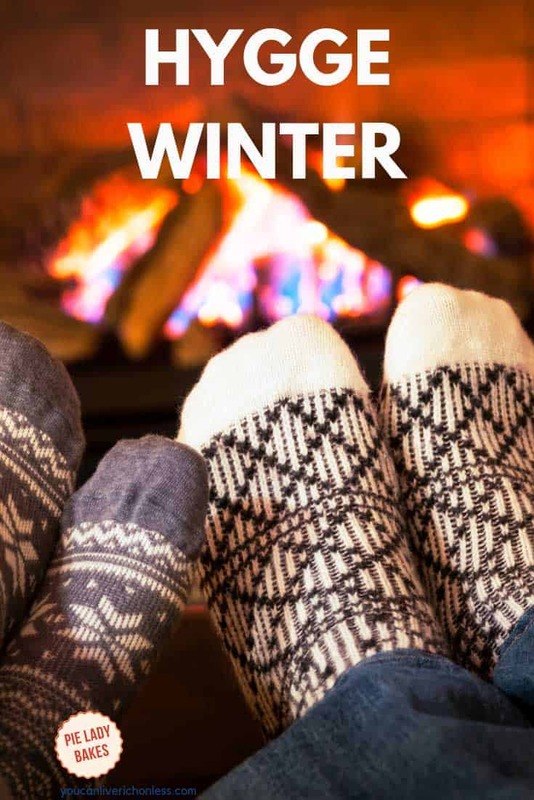 Using Hygge in winter opens up many opportunities to embrace the challenges that winter will throw at you. We’ve listed twenty-one, but before we get to that, go light some lovely candles, set up some soft music, make a cup of tea and relax. 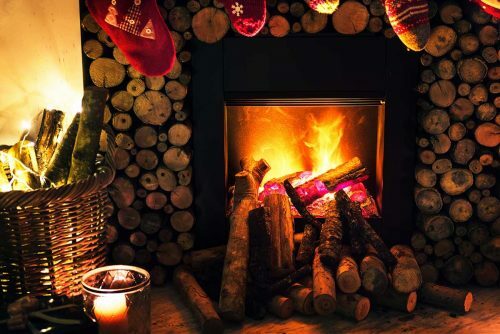 We’re going to help you plan your Hygge Winter activities. Is Denmark dark in the winter? Danish winters are cold and dark, with days that appear to be much shorter than we have in North America. Sunrise is typically around 9 a.m. with sunset at 4 p.m. Even on our shortest day of the year, the Winter Solstice on December 21st, in Canada and the Northern United States, a typical sunrise starts at 7:30 and the day darkens by 4:30 ish. Which is why Hygge is comforting, and helps the Danes deal not only with the cold and darkness, but often the depression that people can suffer as a result. We’ve curated a delightful shopping store full of Hygge gifts, candles, books and chunky blankets. Just click the link. So, how to get through winter? Here is our list of ways that we think are cozy, fun, and definitely cheerful! 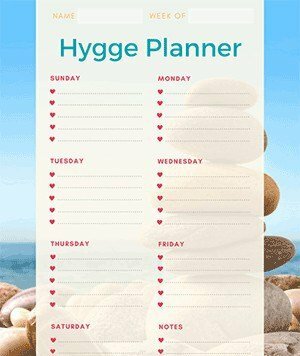 We’ve even got a free printable Hygge Planner for you to download so that you incorporate some of these events into your life over the next few months! 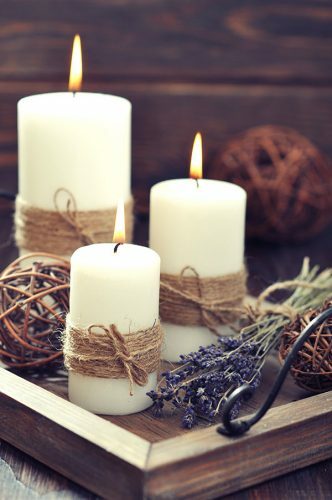 Cozy up your home – Fat white candles, chunky knitted throws, essential oils, soft pillows, it’s all about creating coziness for you and your family. Random acts of kindness – During the holidays there are so many that are not as fortunate as you and I are. Our daughter actually gathers friends and for one night, travels around the city, giving out small gift cards, fresh flowers, and tiny boxes of chocolates. 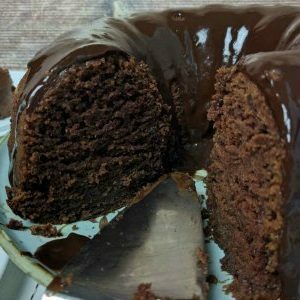 You can make this whatever you want, maybe even create an annual event. Visits to shut ins – Winter means ice and snow, and our elders who may be in assisted living aren’t able to get out and walk. Their families also may live far away. If you have a bit of time every week, even 30 minutes, a visit to your neighborhood retirement home will be gratefully received. Get outdoors – One of the biggest challenges that winter presents is the lack of sunlight, and many people suffer from seasonal affective disorder or SAD? Just a few minutes of daylight per day will chase the winter blues away. Get up from your desk and go for a walk at lunchtime. It really makes a difference! Weekend retreats – This could be something as simple as visiting your folks for the weekend, and that will cheer them up too! Or if you are able to check in to a country inn, or hotel in the next town, maybe where there is a winter festival happening. I found that there are tons of coupons available on these types of weekend getaways too. Family game day – This is one of our favourites! Put down the smart phones and mobile devices and get out the board games, card decks and checker boards! Having a tournament with small prizes adds extra fun and excitement. 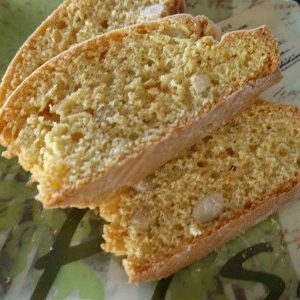 Family dinners – Sundays were traditionally the day for family dinner, but we are all just so busy these days. 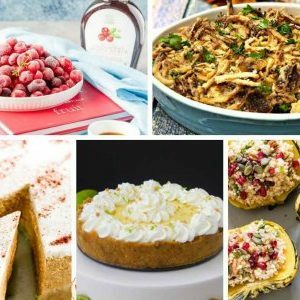 Call up your family and/or friends and talk about a theme – maybe a vegan dinner, or all appetizers? You can personalize this any way you like and send out fun invitations. 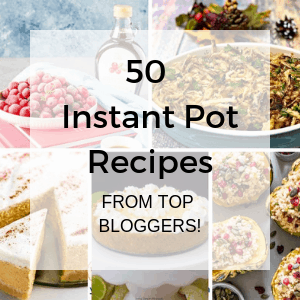 Host a potluck – No time to cook? No problem? 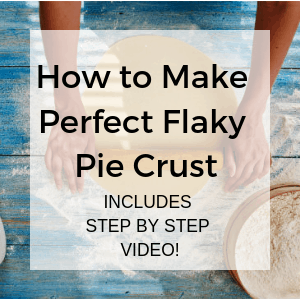 Create an easy menu that family and friends can contribute to, pick a date, clean up the house and be the hostess or host with the most! This is a great idea, especially after you’ve just decorated the house for the holidays, or there has been a really long spell of bad weather. Everyone has cabin fever! What about a Caribbean theme? Try a new drink (cocktails by the fire) – After a day of tobogganing or skating at city hall, be sure to have all the fixing for that new drink you just read about online. Oh, and we don’t let a little detail like not having a fireplace stop us from enjoying a fire. You can ‘stream’ a crackling fire on YouTube or from your local cable company any ole time! 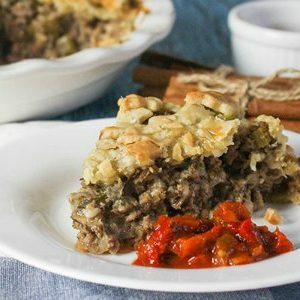 New recipes – When they’re forecasting snow all weekend long? No problem. 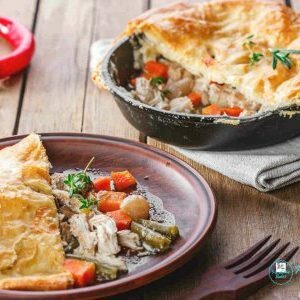 Pull out your slow cooker or pressure cooker and try out some new recipes! We’ve got lots for you to choose from. 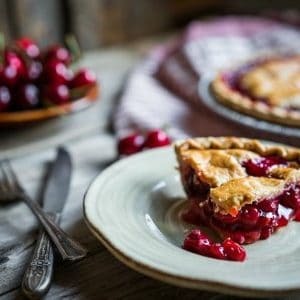 Being forced to stay indoors by the weather, just means you have lots of time to experiment and have a yummy experience as a result! 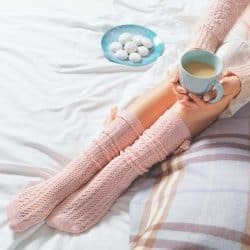 Cozy clothes – The concept of Hygge is all about cozy, and that means big bulky sweaters, fun leggings, and my favourite – reading socks! Hygge Home Decor – When we think about creating a cozy home it’s about big soft pillows, fat white candles, blankets, aromatherapy, soft lighting. Make your bedroom a Hygge Retreat by including some of these delightful items. Learn to knit or crochet a scarf – So to follow my thoughts about those chunky arm knitted blankets, why not learn to make one yourself? I can’t think of anything easier, and there are tons of ‘how to’ videos on YouTube and the web. Make a hygge playlist – Create your own, or you can actually choose a Hygge playlist with Nordic music on Apple or Spotify! Relaxed gentle music, soft jazz, depending on your mood. Or something bright and sparkly! Cozy movie list – Ask your friends for recommendations, but chances are Netflix or Crave have you covered. Like the Hallmark Christmas movies that play this time of year, there really is a tremendous choice out there. We love cooking shows, dramas, and stories about overcoming adversity – you know when the underdog character wins the day? Now that’s uplifting. 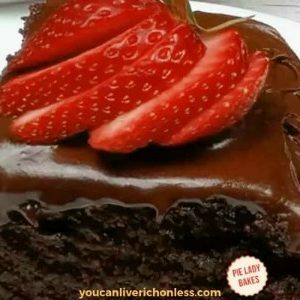 Hot drinks – Cocktails might not be your thing, but that’s no problem! 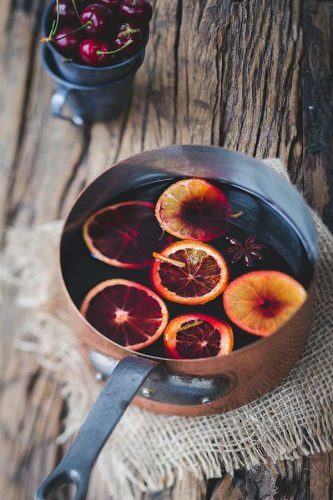 Hot mulled wine, Spiced Apple Cider, Exquisite Teas – maybe Chai? All add to a cozy – I’m not going outside today – atmosphere. 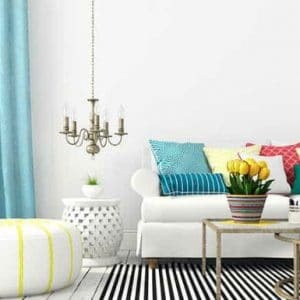 Candles, mood lighting, fairy lights –Creating your own cozy atmosphere is very important, and applies to your personal space, hosting a potluck, or when you invite some friends over just because. We love fairy lights, and use them all year round – you know those mini lights you put on your Christmas Tree? Grab a bunch at your local dollar store and get festive! We’ve also got a neat article about creating your own special place with a DIY fairy light project. Unplug from technology – You really have to do this. I really have to do this. We are all so connected to our mobile devices and it’s epidemic. How do we experience intimacy, coziness and happiness while scrolling? Try to put your phone away for a certain period of time during the day. Say 30 minutes to start. Put it in a spot where you have to get up off your chair in order to use it. Or even better, in another room. Staycation – Stay at home vacations can be so much fun! It gives you the opportunity to get out and experience your community, local festivals, and just enjoy the warmth and coziness of your own home! Appreciate the fact that there is a storm raging outside, and you are inside, in your lovely home, snug as a bug. Practice mindfulness – what does this mean? As much as possible stay in the moment. Listen to what your friend is telling you and look into their eyes while they are talking. Stop the hamster wheel in your head that is going over the huge list of things to do. Appreciate how the snow feels on your face, the warmth of a winter sun, the smell of your grandchild while they sleep in your arms. How does the book you are reading make you feel? Try journaling to capture those special moments throughout your week. Have you tried Morning Pages? 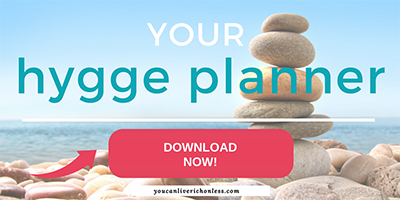 At the end of this post, please download your very own Hygge Planner. I’d love to hear about the things that resonate with you, and if you have tried any.